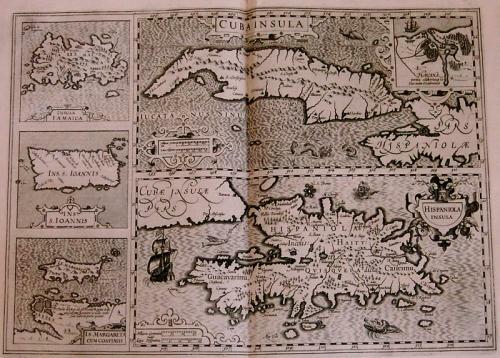 A famous composite map of five West Indian islands from the Mercator/ Hondius Atlas, first published in 1606. The two main maps of Cuba and Hispaniola, each with a title cartouche and mileage scale, are flanked by four smaller maps of Jamaica, Puerto Rico, and Margarita Island off the coast of Venezuela. The Cuba map includes an inset plan of Havana. The map is in excellent condition with wide margins and no discernible faults except for some slight fraying at the bottom margin. The shadow at the centrefold is caused by flash photography. Can we also interest you in these?